St. Mary of the Mills is part of the Archdiocese of Washington’s Catholic Youth Organization (CYO) program. At different times throughout the school year, we offer soccer, cross country, baseball, and basketball for St. Mary of the Mills' students and parishioners' children in grades Kindergarten through 8th grade. Additionally, we offer T-ball for our students and parishioners' children in grades Kindergarten through 2nd grade. CYO programs seek to help young men and women appreciate Christ’s presence in their opponents, use their physical gifts and play fairly and enthusiastically, both on and off the field. Through programs and training linked to parish life, CYO offers young people, coaches and their families another opportunity to work together in communion, showing the world a new vision of “competition” in sports. 2019 K-2 CYO TBall Season is coming soon! The season will begin on Saturday April 6. Practices will be on weeknights and games on Saturday morning. Registration is open until Wednesday, March 20. Register at http://bit.ly/stmarycyotball. All parish children in grades K-2 and all skill levels are welcome. The cost is $70 per child which covers a team shirt, end of year party and medal. If you are interested in coaching contact Jim or Suma Penrose at k2cyosports@gmail.com. All coaches must be in full compliance with the Archdiocese of Washington Child Protection Policy before they begin coaching. Our 14U Girls did again! Feb 24, in a rematch of the 2017 Championship game, our 14U girls beat St. Pius again. This year, they did it in overtime, 31-34! Sadly, one of our players, former St. Mary's student, Clare Andrews, dislocated her knee cap with just over a minute left in regulation. 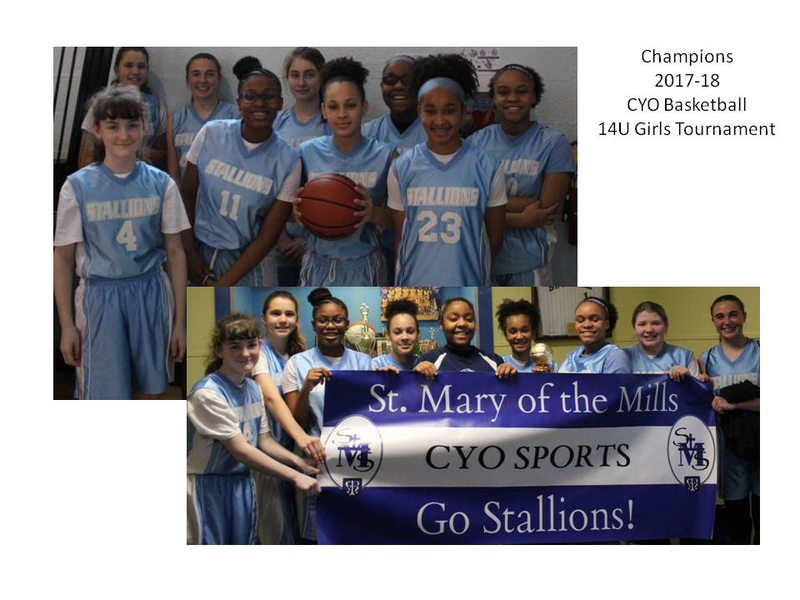 However, the Lady Stallions rallied together to win the championship for Clare and St. Mary of the Mills in overtime! This season is the last season for 8th graders Olivia Allen, Elizabeth Afambo, Sydnee Washington and Kelsey Eggleston. Sydnee and Kelsey have been playing for St. Mary's CYO since 3rd grade. We will also miss our beloved coach, Troy Eggleston, who has been coaching them since 4th grade. Please email cyo@stmaryofthemills.org for details on joining any of our programs.